We’d love your help. 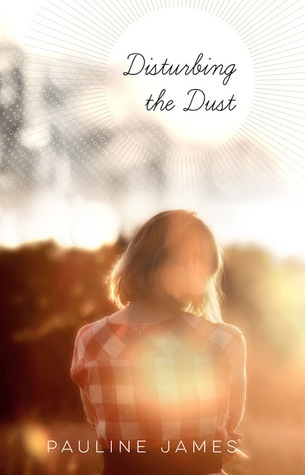 Let us know what’s wrong with this preview of Disturbing the Dust by Pauline James. Jenny Tomlinson has complex feelings about her unusual childhood in England. She is teaching at a school in Australia, when memories of traumatic events, also concerning a dear friend Terry, surface, become intrusive and begin to threaten her emotional wellbeing. She knows she needs to examine them further and, on returning home, her subsequent quest to prove herself and T Jenny Tomlinson has complex feelings about her unusual childhood in England. She is teaching at a school in Australia, when memories of traumatic events, also concerning a dear friend Terry, surface, become intrusive and begin to threaten her emotional wellbeing. She knows she needs to examine them further and, on returning home, her subsequent quest to prove herself and Terry innocent has unexpected repercussions. To ask other readers questions about Disturbing the Dust, please sign up. In 'Disturbing the Dust', how are Jenny's and Terry's characters, as adults, similar to and different from each other? To what might some of these differences be attributed and in what ways do they both change? 'Disturbing the Dust' provides a powerful insight into the psychological damage wrought by social stereotyping in 1950s England. We follow the life of a young girl as she grapples with past injustices and is compelled to make things right. This story reveals in meticulous detail a picture of society at this time. We are transported back in time and are able to understand the horror this young girl felt when no one would listen to the truth. From the moment I began reading this book I could not p 'Disturbing the Dust' provides a powerful insight into the psychological damage wrought by social stereotyping in 1950s England. We follow the life of a young girl as she grapples with past injustices and is compelled to make things right. This story reveals in meticulous detail a picture of society at this time. We are transported back in time and are able to understand the horror this young girl felt when no one would listen to the truth. From the moment I began reading this book I could not put it down - I had to discover the secret which had been hidden for many years. The characters were textured and fully developed which enabled me to bring their features and personalities to life as I read this book. I loved being transported from an Australian classroom in 1973 to an English village in 1951. If you have ever been a teacher - this book will remind you of your experiences. If you migrated to Australia from England you should read this book so that you can enliven your first impressions of Australia. If you have ever been in love....read this book! Jenny is the complex, flawed central character in Pauline James’ novel, “Disturbing the Dust” and it is through Jenny that the reader explores the consequences of unjust accusations. With a calm precision, the author peels back, layer by layer, the trauma of a childhood event which claims its victims well into their adulthood. As Jenny ruminates on the injustice done to her as a child and subsequently to her family, her friend Terry and his family, we discover the effects of the trauma over many Jenny is the complex, flawed central character in Pauline James’ novel, “Disturbing the Dust” and it is through Jenny that the reader explores the consequences of unjust accusations. With a calm precision, the author peels back, layer by layer, the trauma of a childhood event which claims its victims well into their adulthood. As Jenny ruminates on the injustice done to her as a child and subsequently to her family, her friend Terry and his family, we discover the effects of the trauma over many years and how they contribute to ongoing distress and effect present day relationships. The novel comfortably intertwines the past and present and the skilful language recalls to us how important class differences were in England of the 60s and 70s: this was not the England of the cities and their pop culture but the small minded, conservative England of the village. James captures the voice of a quiet, gentle but strong willed young woman in Jenny as she journeys back to the past both physically as she revisits the people and the places of false accusations and condemnations, and mentally as she puzzles over the incidents as they return to her consciousness. It is this voice of the young woman that entices us into accepting the serious significance of the incident and allows us to accept its import. We enter Jenny’s thoughts and emotions and we see through her eyes how hurtful unfairness is and can be if not reconciled. James’ language is beguiling. Through complex sentence structure, she successfully juggles description and insight and juxtapositions ideas. Almost even handed in her approach we learn about these past events, it is only when we can appreciate their significance on the day to day lives of Jenny and Terry that we realise the damage and hurt done. A story of redemption, which “Disturbing the Dust” is, could in some hands be moralistic or trite; it is James’ skill with language which makes this book a psychological drama of surprising depth. When our internal scars keep on opening up the pain affects us daily, those wounds need to be found and treated so they can heal and we can live a life without that pain. This is Jenny’s goal and James shows us how we can do the same. James’ calm reassuring voice throughout the novel, leads us gently through different times, places, people and experiences: she is an excellent storyteller. I highly recommend this novel for a long, thoughtful and enjoyable read. For me, this book certainly did disturb the dust, bringing back memories of my schooling in England and Australia. I was enthralled as I read through the chapters and was transported back in time, as a schoolgirl, to the classrooms of the 50s and 60s. Socially, class distinction was ever present and oh so subtle, so I chuckled as I was reminded of the distinction between napkins and serviettes. I could hear my Grandmother scolding me for asking for a serviette, instead of a napkin (whilst admonishing me for putting the butter directly onto the bread and not on the side of the plate); such was the stereotyping of the day. Moving forward, I was elated as the friendship between the main characters was rekindled. I now want to know what happened when Jenny returned to Australia. Dear Pauline, as you say, “And what of Phil?” We need to know . . . Thank you Pauline for providing such enjoyment. I thoroughly enjoyed reading your work, and highly recommend it to others. A very intelligent and perceptive book that examines the way past traumatic experiences can come back to haunt us later in life. The author is very compassionate and analytical, and begins the story from the point of view of nine-year-old Jenny. Jenny adores her sister's boyfriend, Terry, because he takes time to speak with her. A digging trip for the kids is lots of fun, but the day ends in disaster when an important family heirloom goes missing. Many years later a grown up Jenny is teaching in Aus A very intelligent and perceptive book that examines the way past traumatic experiences can come back to haunt us later in life. Many years later a grown up Jenny is teaching in Australia when the memories of that awful day that flooding back, and she realises she needs to go home to England and sort it out once and for all. I have just finished Disturbing the Dust (only started it a few days ago). Congratulations. I found it completely engaging & really cared about Jenny. The descriptions of her childhood feelings in particular were so real - at times almost painfully so - youngest child syndrome maybe? Over the last few years I have had some trouble maintaining concentration on books - not this one - it had me hooked from the beginning.